Price: £2.49 (incl VAT) Sorry, this item is currently unavailable. Click here to receive notification when this product comes back into stock. 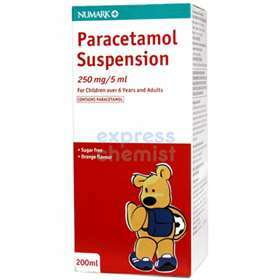 Paracetamol can be used for the treatment of mild to moderate pain and feverishness associated with teething, toothache, headache, colds and flu. For oral use. Shake bottle well before use. 6-12 years: One to two 5ml spoonfuls. Adults: Two to four 5ml spoonfuls. Repeat dose every 4-6 hours as required, up to a maximum of 4 doses in 24 hours. Do not consume alcohol whilst taking this product. Do not take with other paracetamol-containing products. Consult your doctor before taking this medicine if you have any existing medical conditions or are taking any prescribed or bought medicine. If symptoms persist or get worse consult your GP. Each 5ml dose contains 150mg of alcohol - Not suitable for those suffering from alcoholism or liver damage. PARACETAMOL, XANTHAM GUM, MAGNESIUM ALUMINIUM SILICATE, GLYCEROL, HYDROGENATED GLUCOSE SYRUP, SODIUM BENZOATE, CITRIC ACID MONOHYDRATE, SACCHARIN SODIUM, ETHANOL, POLYSORBATE 80, SORBITAN MONOLEATE, ORANGE FLAVOUR, SUNSET YELLOW AND PURIFIED WATER. Product code: 1065515 Price: £2.49 (incl VAT) Sorry, this item is currently unavailable. Click here to receive notification when this product comes back into stock.